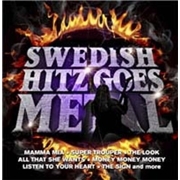 SWEDISH HITS GOES METAL is the brainchild of Tommy ReinXeed, applauded by label boss Christian Liljegren no doubt. The objects of the spotlight are really ABBA, ROXETTE and ACE OF BASE, and the hits no one has ever missed. Tommy started in music at an early age and is influenced by a.o. GARY MOORE. This album came about when Christian Liljegren stumbled across Tommy´s ABBA interpretations on YouTube, and got hooked. Next up is a tour with a five-piece band all around the world. So, is the album that good? Aw well, what can I say against ABBA songs like “Mama Mia”, “Money Money Money”, “Super Trouper” and “The Winner Takes It All”? Or export success ROXETTE`S “The Look” etc.? Or even ACE OF BASE, who seems at ease among the other super hits? Nothing much. But the performance seems hurried, and the sound not exactly optimal. May be down to the files I got but still. At the same time most of the money in music these days lay in gigs, which are already lining up. And the album as such has served its purpose as a vehicle for the upcoming tour. Very smart in these days of illegal downloading. But nevertheless, I like the song choice, the idea and the fact that metal got a new spotlight kid up there with Måns Zelmerlöv performing “The Look” in front of loads of viewers of Allsång på Skansen. All the best Tommy.